The world youth population is the largest ever and the levels of problem behavior will influence future global health. Recognition of these issues raises questions as to whether adolescent development knowledge can be internationally applied. To date, most research examining adolescent problem behavior has been completed in the United States (USA) and there has been neglected analysis of health inequalities. The aim of the present study was to compare the structure and predictors of problem behavior in representative samples from the USA, Australia, India, and the Netherlands. Two timepoints of longitudinal data were analyzed from the International Youth Development Study that originally recruited state-representative student cohorts in 2002 in Washington State, USA (analytic sample N = 1942) and Victoria, Australia (N = 1957). Similar aged samples were recruited in Mumbai, India, in 2010 (N = 3.923) and the Netherlands in 2008 (N = 682). Surveys were matched and follow-up occurred over 1-year (average baseline ages 12 to 13). CFA identified a latent problem behavior construct comprised of substance use and antisocial behavior indicators. There were cross-national differences in the indicators for this construct. Factor loadings and items were similar between Australia and the USA; however, different items loaded on the construct for the Indian and Netherlands sample. SEM identified that problem behavior at time 2 was predicted by time 1 behavior, with cross-national differences evident. Low parent education was predictive in the USA and India. The number of risk factors present was predictive of problem behavior in all four nations. 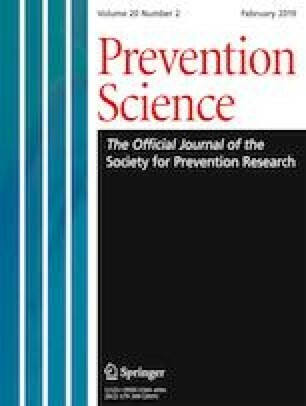 The findings suggest that evaluated preventative strategies to reduce adolescent problem behavior may have international applications. The analysis of cross-nationally matched longitudinal data appears feasible for identifying prevalence and predictor differences that may signify policy and cultural contexts, to be considered in adapting prevention programs. The online version of this article ( https://doi.org/10.1007/s11121-019-01007-3) contains supplementary material, which is available to authorized users. Original IYDS data collection in Washington State and Victoria was funded by the National Institute on Drug Abuse (R01-DA012140-05). Mumbai data collection was funded by a Major Research Project grant (F No 5-236/2008(HRP) from the University Grants Commission, India. The Dutch study was funded by the Netherlands Organization for Health Research and Development (ZonMW: 120610017). Data management, analysis, and reporting were supported through funding from the Centre for Social and Early Emotional Development (SEED) at Deakin University, Australia. The funding agencies had no role in the study design, data collection, analysis or interpretation, writing of the report, or decision to submit the paper for publication. The corresponding author had full access to all data in the study and had final responsibility for the decision to submit for publication. The authors declare their independence from the funders and from any tobacco, alcohol, pharmaceutical, or gaming industries or anybody substantially funded by one of these organizations. The present study uses the Communities That Care survey that Professor Catalano co-designed. Professors Toumbourou and Dr. Rowland have served as volunteer Directors or Officers with Communities That Care Ltd., the not-for-profit company that owns the Communities That Care survey in Australia. For the IYDS US sample, ethics approval was obtained from the University of Washington (Washington State) and for the Australian sample from the University of Melbourne and the Royal Children’s Hospital in Victoria. Appropriate school districts and administrators gave permission for school data collection in each location. Written parental consent was obtained, and students provided assent to participate in the study on the day of the survey. Ethics procedures for Mumbai mirrored the IYDS in the USA and Australia. The Research Ethics Committee at the Rayat Shikshan Sanstha’s Karmaveer Bhaurao Patil College, Vashi, Mumbai, reviewed and approved the Mumbai IYDS study design in early 2010. Approval was obtained from school authorities and from principals. After obtaining the school approval, parental permission was sought to survey children in the target classrooms. After receiving school and parental consent, students were asked to provide their assent before filling out the questionnaire. Approval for the Dutch study was provided by the Verwey-Jonker Institute and regional municipal authorities. Parents and young people provided informed consent as a requirement for young people to participate. Britton, A., Ben-Shlomo, Y., Benzeval, M., Kuh, D., & Bell, S. (2015). Life course trajectories of alcohol consumption in the United Kingdom using longitudinal data from nine cohort studies. BMC Medicine. https://doi.org/10.1186/s12916-015-0273-z. Patton, G., Sawyer, S. M., Santelli, J. S., Ross, D. A., Afifi, R., Allen, N. B., … Viner, R. M. (2016). Our future: A Lancet commission on adolescent health and wellbeing. The Lancet, 387(10036), 2423–2478. https://doi.org/10.1016/S0140-6736(16)00579-1. Solomon, S., Minaie, M. G., Toumbourou, J. W., & Catalano, R. F. (2012). How are adolescents faring in the rapidly modernising city of Mumbai? A cross-national comparison of adolescents in Mumbai, India; Washington State in the USA and Victoria in Australia. Retrieved from https://doi.org/10.13140/RG.2.1.3543.0804. Vazsonyi, A., Chen, P., Young, M., Jenkins, D., Browder, S., Kahumoku, E., … Michaud, P.-A. (2008). A test of Jessor’s problem behavior theory in a Eurasian and a Western European developmental context. Journal of Adolescent Health, 43, 555–564. https://doi.org/10.1016/j.jadohealth.2008.06.013.